Meatloaf is one of those comfort foods we all grew up eating as a kid. This recipe will not disappoint! for Christmas and thought individual mini meatloaves would be a perfect recipe to break it in. 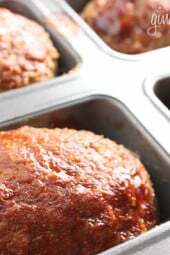 These low fat meatloaves are kid friendly and they cook quicker than making one big loaf. I actually prefer turkey meatloaf to beef, it’s always moist and has great flavor. I replaced breadcrumbs with heart healthy oatmeal for added nutrition. Serve this with Skinny Garlic Mashed Potatoes and a fresh veggie for a complete meal! Saute olive oil and onion on low until translucent. In a medium bowl mix turkey, onion, oatmeal, egg, ketchup, salt and marjoram. Divide into four equal loafs and place each loaf into a non stick mini loaf pan or shape into small loafs on an un-greased nonstick baking pan. In a small cup mix remaining 2 tbsp ketchup with worcesterchire sauce and brush onto each loaf to give it a nice glaze. Bake uncovered for about 40 minutes at 350°. After baking let it sit for 5 minutes serving. I made this tonight with the oats to make it a healthier version. It was delicious and the family loved it. My husband said it should definitely go into the rotation. I highly recommend this meatloaf! We had it with a salad and it was perfect. I can’t use oatmeal due to allergies. What can I add in it’s place? My husband and I enjoy it very much. We have it often. I’m sorry but I’m not understanding the Smart Points vs. the Freestyle points. I see one tha just says “Points 5” and one that says “Smart Points 3”. You say the Smart points have been changed to teflect the Freestyle. So which one am I to count? The Points plus is 5 (program before Smart Points), the Smart Points have been updated to reflect the new Free Style program. Hope this makes it less confusing! Would the Smart Points “decrease” with the new FreeStyle plan? Smart Points have been updated to reflect the Free Style program. Did you happen to calculate the FreeStyle Smart Points for these? The Smart Points have been updated to reflect the Freestyle Program. Thank you Gina. Sorry for the double comment on this. This recipe is great for meal prep and every night is like a little serving of healthy comfort food! Pair with veggies and you’ve got the perfect dinner. Great way to get 4 quick meals out of a package of turkey! Maybe 4.5 stars based on taste, but the value and simplicity are worth a lot. 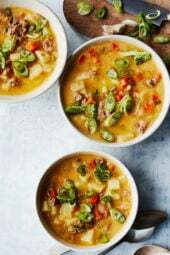 I specifically look up your Freezer Friendly meals and this is a perfect way to use up turkey, make a dinner, and throw a couple in the freezer (if you’re cooking for 1 or 2) for an easy, healthy meal. I accidentally forgot the egg and found it sitting on my counter after my mini loaves had been in the oven for 20 minutes, BUT they still turned out amazing and still stayed together pretty well because of the ketchup. Perfect portion control for me, and my husband was still able to feel full by having two. I added one tbsp of Sriracha (tip that I saw from another commenter), and it was delicious with the perfect hint of heat! Definitely going to make again. The best turkey meatloaf!! Only thing I like to do is Sautee a little green pepper with the onions! If I were to use a muffin pan about how many meat loaves do you think the recipe would yield? Loved this recipe!! Was just putting in my WW app and noticed that you didn’t list the saturated fat or sugar. Do you have that info? I don’t but the calulator is never accurate, the only way to do the correct is with the WW recipe builder which is how I do all the recipes. I made these in muffin tins tonight. Fantastic! I divided them evenly amongst 12 tins and cooked at 350 for 25 minutes. I substituted lean ground beef because my husband can't eat turkey and did not need to use non-stick spray. I grew up hating meatloaf because my mom made it with Lipton Soup mix, but these were beyond amazing. Definitely having these again. I made these last night, and they were great. Instead of the oats (since I only had old fashioned instead of quick) and to make it whole30, I used 1/4 cup of coconut flour. I used a jumbo muffin pan and it made 5. We ate them last night for dinner and have the leftovers for lunch! I served it with the roasted vegetables from your balsamic chicken thigh and roasted vegetable recipe. I made these tonight for dinner and used a standard sized muffin tin. It made 10 'muffins' and I cooked them for 30 min. I estimated (through MyFitnessPal) that they come out to 81 calories per 'muffin'. I also omitted the oil and sauteed onion for 2 tablespoons of dehydrated onion. They were REALLY good. Hi! This recipe looks great, but I don't usually have 40 minutes for cooking time after prep. Could I prep these the night before and then just pop them in the oven 40 minutes before dinner? Your website is perfect for weight watchers. I love how everything is pointed. I tried a few of your recipes and so far the were fabulous and even fun to make. I have you on my favorite list. I have been using this recipe for the last few years. It is the only meatloaf recipe that i use now and prefer it over any other….even traditional beef. I do it in a regular loaf pan and just adjust the cooking time. Simple and delicious!! Thanks for all of the great recipes you provide! Hello! I would like to make these as a second meat for my Passover meal (I plan to double the recipe). Can you please let me know what I can sub for the oats since oats are not Kosher for Passover? Also, how much of the sub do I need in place of the oats? Thanks so much! They've changed the plan since it was originally posted. I assume the meat is higher and maybe even the oatmeal. Recipe builder definitely has it as 7 Pts+. Just entered in the stats for the fat/carb/fiber/protein and it lists it as 5. Tricky. I also calculated this at 7 Points Plus using the recipe builder and 99% lean ground turkey. Still worth it, just trying to be accurate. They are delicious and easy! Not sure If I missed it – if your making freezer meals for someone – do you put together ingred then bake and freeze or just mix ingred and freeze? Do you have any other suggestions for freezer meals? Just prepared this for dinner. Officially my favorite meatloaf recipe of all time. Ever. So delicious! Thank you! i bout the ingredients before i read the comments, can i use old fashioned oats? Oh no I just made this and missed the step about cooking onions first! Made these tonight and they were a hit. Thanks for the recipe. I really like the oatmeal instead of bread crumbs…I think I'll use oatmeal from now on! Doubled the recipe, added some garlic, and used egg whites. Served with garlic and pepper mashed sweet potatoes. They turned out to be delicious! I'm so excited to try this recipe…I'm new to your site, but I tried to banana nut bread and chicken rollatini…both amazing!!! but quick question, how would it affect the points if I used 93/7 ground turkey instead of 99? This is amazingly flavorful! I will make it again! This is one of my favorite SkinnyTaste recipes. It made my husband a believer in ground turkey! The one thing I modify is adding some chopped up red peppers. It's delicious and helps me get more veggies! I must admit that I wanted to try this recipe so that I could have an excuse to buy a new kitchen gadget. I am so glad that I did because I LOVED it. I wasn't sure about using oatmeal but it worked. The serving size was perfect and my family loved them. Made these tonight and they're delicious! Just made them and loved them! Since I have to feed the kiddos I hid in them carrots and zucchini and put them on muffin pans. Loved this just made them! Used muffin pan. Turned out perfectly! Husband and I LOVED THEM! I just got a Pampered Chef mini loaf pan today and I can't wait to make these. I made your regular size meatloaf recently and struggled to only eat what I should, so this will be perfect!! I made these last night as i had a pack of turkey meat in the freezer that was getting frosty on it so i needed to either toss it or cook it. We usually do not like ground up turkey unless its the seasoned kind from the store but this recipe made it likeable! omg it was so good! I made this again last night except this time I used the 99% fat free ground turkey as mentioned in the recipe. I also added an extra tsp of worcester sauce to the turkey mixture. So yummy and moist! Love this so much. It's absolutely one of my FAVORITE recipes and perfectly sized for portion control! These are delish! My 11 year old son is asking for them again! They are a perfect size too! Great flavor! 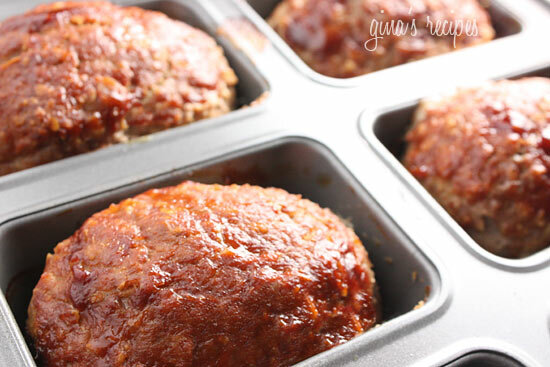 Made these last night–the BEST turkey meatloaf EVER. I sprayed a 12-cup muffin tin with some non-stick spray and then used a 1/4 cup measure to fill the tin. They cooked for about 25/30 minutes. We each ate 3 mini meatloaf muffins since that was 1/4 of the recipe. Adding this to my must make AGAIN pile! Served with your garlic mash and a big green salad. Perfection! These look AMAZING, but I put this in the recipe builder and it came out to 7pp – is the oatmeal reduced calorie??? 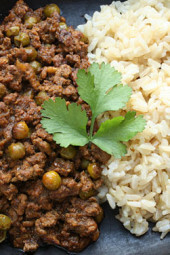 Gina, this recipe is one of my all time favorites!! Amazing! I added some low point bacon (1 pt for 2 slices)mixed into it and topped with spicy bbq sauce instead of ketchup! It was to die for, even had it for breakfast, lol!!! Had it with your cheddar garlic bisquits and garlic mashed carrots and potatoes! Even the pickiest of eaters (my 7 yr old) was raving about it! Thank you for making WW so user friendly! Made this last night and it was amazing. Didn't have any marjoram so I used thyme. My boyfriend had seconds and he only likes "junky food". Made baked potatoes and salad to go with it. Was a very filling meal! Thank you for all your amazing recipes… have not made one yet that disappoints!! Made these tonight subbing chicken broth for olive oil and sage for marjoram. Wonderful!!! Will make again for sure!! My kids love these! My husband said it was in his top five for best meatloaf ever (next to his dear late Gramma's). could you add the sodium content as well to nutritional info. recipe looks great but my dad has a 2g sodium restriction. I know I can omit the salt, but the ketchup n Worcestershire sauce has sodium as does the meat. This is SOOOO yummy! I think you should call your website "yummy taste "
I have never had anything I didnt like. My kids loved this, that is a testimony to it's greatness! This was delicious. My 2 teenage boys and my husband definitely wanted more though! I may have to double the recipe just for them! With egg allergies in the family what could I substitute for the egg? Love your site!! I just made these the other night with a big salad for the side and the family just LOVED it!! They told me right away that I have to add this recipe to our favs. 🙂 Thank you so much Gina! I made these for dinner tonight, although with ground beef instead of turkey (couldn't find ground turkey; it's not common here at all). I also used jumbo muffin cups instead of mini loaf pans. Served them with Skinny Mashed Potatoes and steamed broccoli – a winner that will definitely be featured on our family menu again! 🙂 Thank you so much for sharing your wonderful recipes. I divided the mixture to fill all 8 cavities in my pan. 1 1/2 was enough for me, hubby had 3 and son had 2…that leaves another 1 1/2 for me for another meal 🙂 I served them with Skinny Mashed Potatoes and carrots, zucchini, crookneck and snow peas. Another winner! Love this recipe. I did change one thing, though; I added 1/2 cup grated zucchini to the meat mixture to try to add a bit of extra moisture. Baked them in muffin tins and put the finished loaves on top of a bed of mashed potatoes. My boys LOVED them– didn't notice there were veggies involved! These were fantastic! Very flavorful and tasty. I skipped the marjoram because I didn't have any and I don't think it made a difference. Didn't lack flavor at all. Will most definitely be making these again! Wow, I've tried so many meatloaf recipes and this was the BEST by far. So easy and amazingly delicious. This will be a go to this fall and winter . . . you are the best, Thanks! You would have to use recipe builder to see the difference, if any. I couldn't find 99% ff turkey so I bought 937 kind. It was the only one available. But how do you figure out the points using it instead of the 99% ff. DELICIOUS!!! I added some garlic powder, a few grinds of pepper, and topped it with ketchup! I also used Stove top herb bread crumbs bc they were on hand. Super flavorful and my Husband LOVED it! I made this 2 nights ago and my family loved it! they never like when I make meatloaf especially when it's using Turkey instead of beef, But everyone loved it. It was gone in no time and they asked if I'd make it again for dinner the next day. So with all that said, We had Turkey meatloaf 2 nights in a row. I think I just found a new family favorite!! p.s. I didn't have a mini loaf pan so I just made it in one big loaf and it was wonderfully delicious!!!! That sounds lovely, I may have to try it! Dry oats go in here. Are these old fashioned oats or the quick ones? Would love to know which kind of oatmeal also! Hi Gina! So excited to make these tonight. Quick q- when you say "oatmeal", do you actually cook the oats to make oatmeal and then add it? Or are you putting the dry oats directly into the recipe? I know I'm probably thinking way into this but I'd appreciate the help!!! I've been making the mini turkey meatloaves for awhile, however, I make it a little more greek. I omit the egg and use a package of frozen chopped spinach (thawed and drained). It serves as the binder and keeps it moist. Use oregano instead of marjoram and I also add 4 oz. 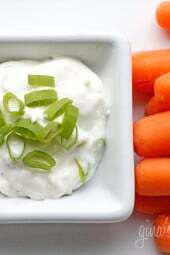 of low-fat feta to the turkey mixture and serve with homemade tzatiki sauce. By using the spinach, it allows me to make 8 mini loaves instead of 4. One mini loaf is 4 points+ and the sauce is 1 points. Delish!! Thanks ays, yes it has 8 but I didn't load every space. Enjoy!! I love your blog, by the way!! This is the first recipe I tried from your site – amazing! They were very moist and very flavorful. I can't wait to try more recipes! I tried this one tonight but with ground chicken. I was very surprised at how moist they were! I only had a pound and still added the other ingredients as specified, so that could have made up for any lost moisture. But WOW! I have to commend you on this one, it was amazing! The points would be the same, the whole recipe serves 4. I am going to try this recipe tonight and would like to know if i used whole wheat bread crumbs how it would change the points. Also I am going to us a muffin pan. Would the servings be one per person? Thanks again for all your help and hard work!!! Delicious. Made it tonight and my husband could not stop raving about it. And I thought it was yummy too even though I usually think of meatloaf as an alien life form! We like spicy food, so I added a teaspoon of Sriracha sauce to the glaze. Thanks for a great recipe. I've tried the chicken enchiladas and this meatloaf recipe. My family loved both! Can't wait to try more! I made these tonight and they were yummy. When I built the recipe on WW site it came out to 7 points plus. Did I do something wrong? Thank you for all the yummy recipes. I made these last night and they were a huge hit! I did add a little cayenne pepper (1 tsp) to up the flavor just a little more…everyone loved them..thanks for another great recipe! cant wait for lunch tomorrow!! what a great way to use ground turkey while being so freakin simple!!! I just purchased a mini loaf pan, and was looking for a good recipe. I'm so happy that I found this site! Thank you for making it so easy to figure out the Points for yummy recipes! I'm so excited to try this recipe out tomorrow night! This is my new favorite site!